When it comes to aviation, there are plenty of options for maintenance stands. Do you need a small stand to perform routine maintenance and inspection of the rotor hub? Or do you need a large system that allows you to completely tear apart and rebuild the aircraft? From simple fueling stands to complex wrap-around systems, aviation maintenance stands come in shapes and sizes to suit every need. Below, learn about some of the most common types. 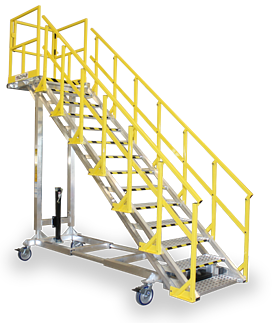 Phase maintenance stands are used to perform complete depot-level maintenance of aircraft. They often wrap completely around the aircraft, and they are designed to interface with the tooling and equipment at the various stages of assembly and disassembly. Air and electrical service is often provided, so there is no need to pull electrical and air hoses up and over the platform. The set-up time is longer for phase maintenance stands than for other platforms, and they typically have less flexibility, as they are designed for one specific application. Daily maintenance stands are work platforms used for regular maintenance activities. They typically consist of one deck with a staircase or ladder. They are easily moved and repositioned, and they may be designed to be towed at slow speeds. The best daily maintenance stands have the flexibility, both in terms of height adjustability and configuration of railings and stairs/ladders, to be used for a variety of access requirements, and they can often be used on various aircraft or vehicles. 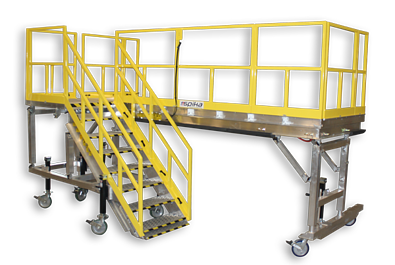 Daily maintenance stands can be built for inside or indoor/outdoor use, and it is important that they provide adequate fall protection both when used against the aircraft or as a stand-alone platform. Intended for use in the field or in situations where the platform may be moved regularly, deployable maintenance stands are designed for rapid, tool-free setup and teardown. Because of this, they may not come with some of the features standard to more permanent platforms, such as variable-pitch stairs, but in terms of usability and interface with the aircraft they should be equal. They are typically designed to be palletized into a small, consolidated space. 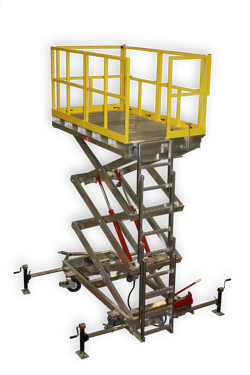 Scissor lifts typically have a much greater range of height adjustability than other work stands, so the same platform can be used on aircraft as large as the CH-47 Chinook and as small as the UH-72 Lakota. One potential issue with scissor lifts is that such versatility comes at the expense of quality access and user friendliness. Over-reach capability is often compromised with scissors, and access stairs or ladders that accommodate the greater height variation can be somewhat cumbersome. The phrase industrial work stands is an umbrella term that covers all categories of work platforms. It includes aviation maintenance stands, industrial maintenance stands, work platforms used in manufacturing, stands custom designed for very specific applications, and general multi-purpose work stands. One of the features of all industrial work stands is that they are designed and constructed for regular, rigorous use, not home or office light-duty activities. 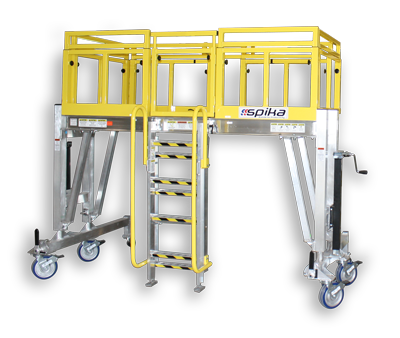 They are designed to comply with all OSHA (or other safety program) regulations related to working at elevated levels, having proper safety rails, stairs, and ladders, and having the capacity to support the intended load. Are you uncertain which type of platform will best suit your requirements? Do you need something unique? Contact Spika with your questions or custom design requirements!